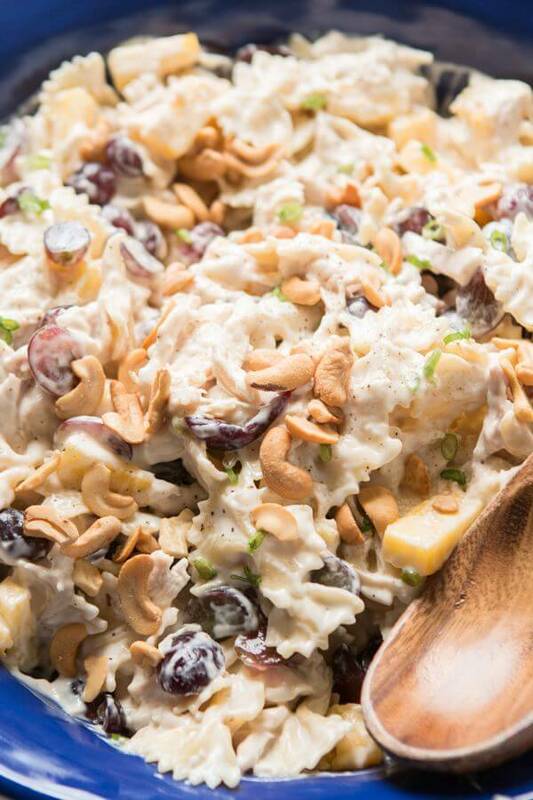 Bowtie chicken pasta salad is perfect for a BBQ. 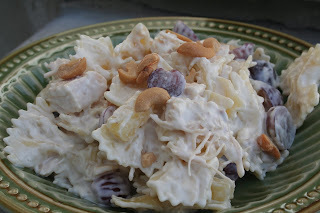 Creamy dressing, juicy pineapple and grapes, crunchy cashews and lots of chicken! Awhile back, my girlfriend, Lindy and I were talking and she brought up this pasta salad that I have not had in months and months. The salad was very familiar to me. 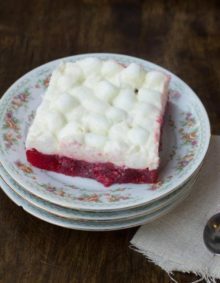 My parents’ best friends, the Glems, well Peggy, made this for BBQ potlucks etc growing up. So, my mom got it from her and I got it from my mom. Of course talking about it made me want it so I decided to make it as soon as possible. You see, I am a picky pasta salad eater. I think a lot of pasta salads are bland, too oily, or plain ol’ weird. 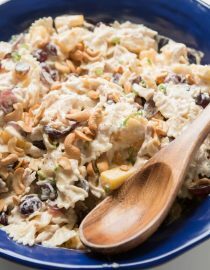 The Bowtie Chicken Salad is one of the few pasta salad recipes that I actually really like. It’s not even full of spice, but the creamy flavor with all of the different textures really is so good. And guess what, it’s the pineapple that’s my favorite. And it’s the cashews that make the dish. You need a little crunch with that creamy pasta. So, back to the story. A few days passed and I was ready to make the salad, but of course I couldn’t find the recipe anywhere. So irritating. I called my mom, who of course was not answering the phone, so I hurried and texted (is that even a word?) Lindy and asked her to email it to me. The girl was quick, and I had it right away. Then my mom called back. Things always happen like that. So now I have both recipes and guess what, they are a little different and so I just did a combo of both. OH, was it good! If you want to you can add green onion, almonds, chopped apples, and celery. Both recipes had more than what I put in, but it’s up to you. What Kind of Pasta is Best for Salads? You will want a pasta that holds up well when tossed with dressing. Short pasta shapes, with plenty of surface area to hold the dressing — like fusilli, farfalle, rotini, and penne, bowtie, shell — are ideal choices for pasta salad. 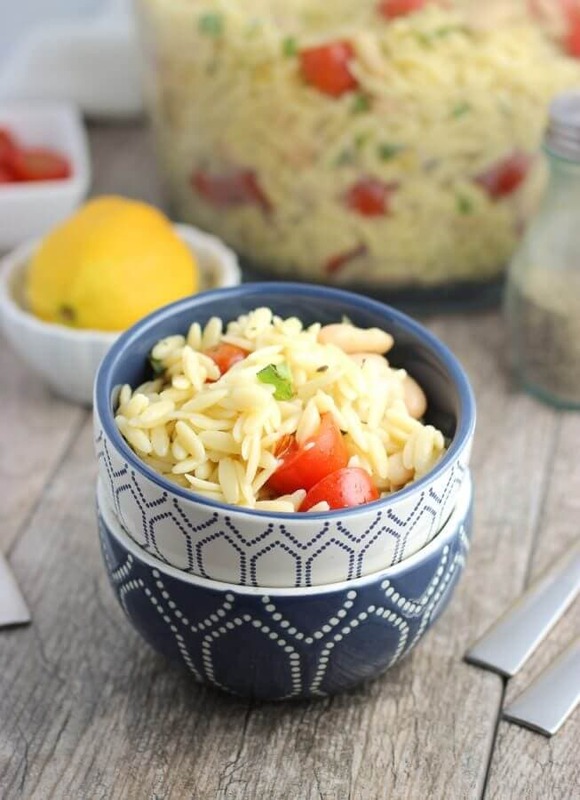 What do you Serve With Pasta Salad? 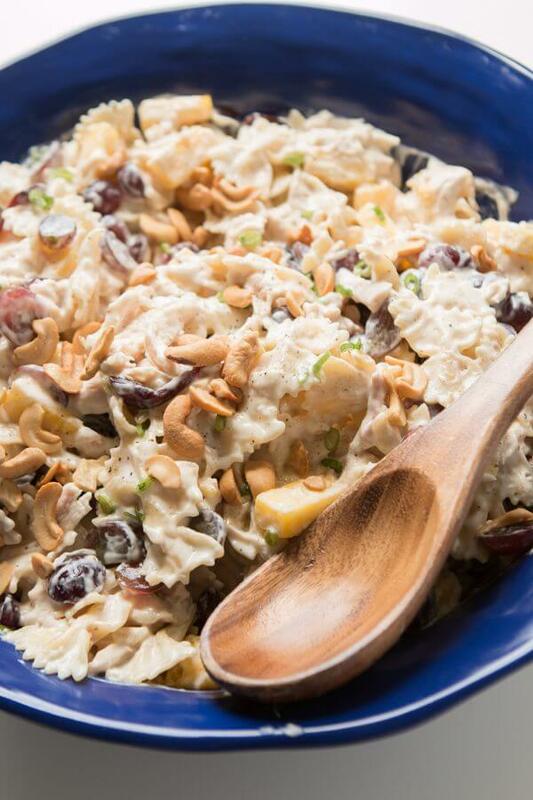 Fruit is a great companion to pasta salad. Fruit slices, fruit cups or a big fruit salad, goes well with pasta salad. Fresh summer fruits, berries and melons add a light refreshing touch. Also, crisp, fresh breads and rolls will round out the meal. How Long Will Pasta Salad Keep in a Refrigerator? 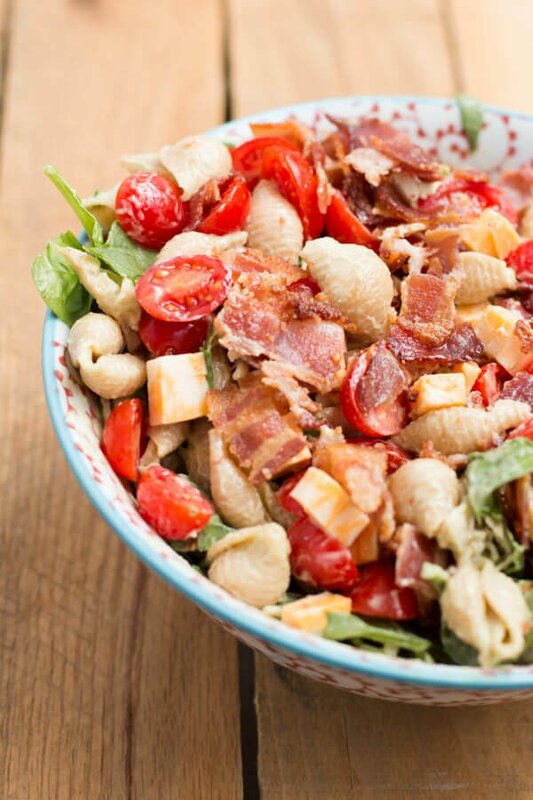 Pasta Salad with mayonnaise will keep 3-5 days in the refrigerator. If your pasta salad does not contain mayonnaise, it should keep 5-7 days. Mix together the pasta, chicken, mayo, dressing, salt and pepper. Place in the fridge with plastic wrap for 30 minutes or up to all day. Remove from the fridge and add remaining ingredients. This recipe sounds very good and I tried it last night. It makes a TON! I thought that 2 cups of mayo plus a jar of slaw dressing sounded like an awful lot, so I only added 1 cup of mayo. Even then, I wish I hadn’t added the whole bottle of slaw dressing, as it ended up “wetter” than I would like. Still the flavors are good, even though I forgot to add the pineapple! I’m so spacy sometimes! I’ll add it later. 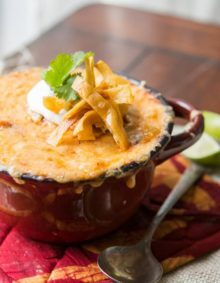 I have made this recipe twice using a rotisserie chicken. 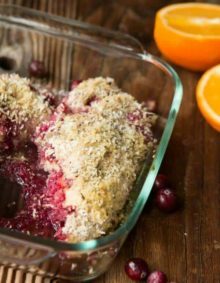 The first time I used the coleslaw dressing as in recipe and added a tablespoon of poppy seeds…the second time I replaced the coleslaw dressing with an equal sized bottle of Henry’s Sweet and TangyBlend Tas-tee Homestyle Dessing. I liked the second one the BEST, but original recipe is definitely good. 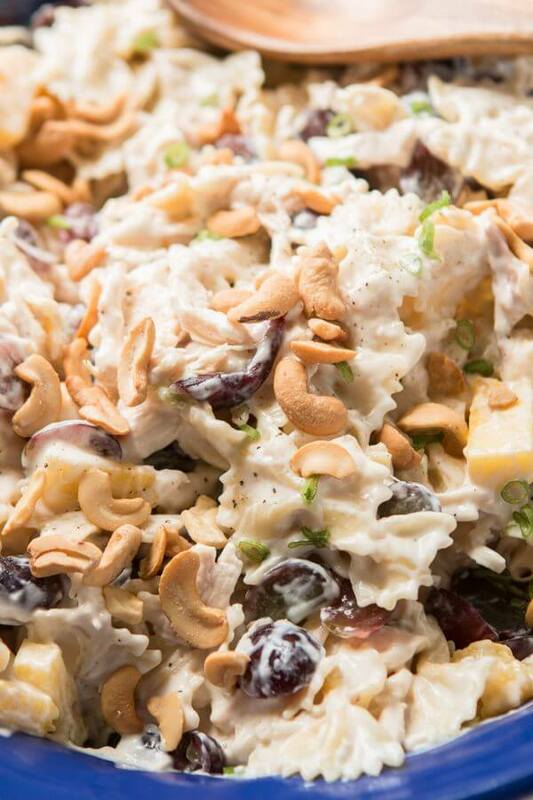 The pineapple, cashews and grapes are SO good in this salad! I need to go look for that dressing. I haven’t heard of it, but I definitely want to try it now! Where did you find it, just any grocery store? I just wanted to share that I made this yesterday for a picnic and it was quite easily the star of the show!! 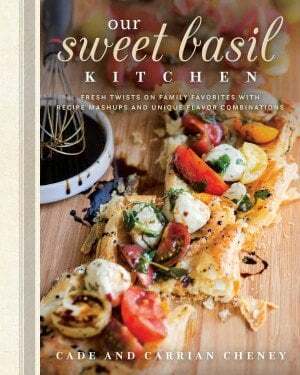 Everyone just loved it and several people asked me for the recipe. A home run for sure!! I did add the green onions which I think really enhanced the flavor. I will definitely be making this again 🙂 Thanks for the great recipe! Making another batch to take to the Outer Banks! (We leave tomorrow) I think this would make a fantastic light lunch to enjoy on the beach 🙂 Thanks again for such a great recipe!!! Oh that sounds all kinds of wonderful, enjoy! For a time saver. I’m elderly and have trouble standing for a long time. I throw 5 – 10 pounds, yes, pounds, of boneless breasts in my crock pot. When they’re on sale for #1.99 a pound, no big deal!! Add whatever seasonings or herbs you like. Cover with broth and let those puppies cook for 6 – 8 hours. I let them cool a bit, break them in 4 or 5 pieces for each breast (or do a coarse chop), put them in a couple of Ziplocks and into the freezer. I strain the broth and bag that and throw in the freezer too. You are set with chicken for at least 2 – 3 weeks. I make chicken salad, stews, sandwiches. If I’m making a stew, I just throw in the frozen chicken, plus some of that broth…done! Dianne, what a wonderful idea!! Even if standing isn’t an issue what a wonderful time saver. Thank you for the tip!